I watched Michael Smerconish's interview with Michael Wolff Saturday morning on CNN. I know it is a tad strange to be commenting on the host of this site. But I think the exchange, Wolff’s response particularly, speaks to a breakdown in public dialogue. Smerconish immediately laid his cards on the table that he did not know what he could ask in the interview that had not been queried countless times since the bombshell hit. And Wolff probably thought that he was walking into friendly territory and that the interview would be just another sale session for the runaway best seller. The interview made for good television, but I wonder if Wolff feels he could have handled it differently. The source of tension was that Smerconish had access to emails sent from Wolff to the Trump communications team that outlined his pitch for access. The emails make it clear that Wolff made the Trump Administration believe he wanted to make his book a sympathetic portrait. Wolff suggested his work was a chance for the White House to drive a narrative not seen in the mainstream media. If the White House is telling the truth, Wolff was a wolf in sheep's clothing. Smerconish challenged his audience to wonder: if Wolff misrepresented himself, does that call into question the veracity of the disputed sections of the book? 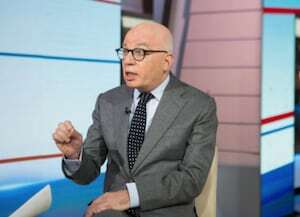 Within moments of Smerconish citing the emails, Wolff immediately charged the host as a tool of the White House. Wolff’s response undermined his own credibility. He should have reiterated he went into the book with an open mind, but was going to do what he needed to do to achieve the needed access. He could have said, “The ends justified the means in my book.” In fact, Michael Wolff has done the nation a favor with his reporting and if that had to be the path of persuasion, so be it. But what about the White House? If anything, the Smerconish emails reinforce the perception that the Trump team is made up of rank amateurs. How naive could they have been that a fly in the wall treatment by this particular reporter was going to be a love volume to the president? The Trump family and friends should have seen Wolff coming a mile away, but they looked at Wolff as a reflection of themselves and were blinded by their hubris. Of course, Steve Bannon cleared the way for Wolff so that he had the goods to back up his statements such as the Trump revolution was over and the president would not serve four years. The administration’s failures make it even more confusing why Wolff was so defensive on Saturday. He should embrace his statements and point to the final product as proof. In my estimation, the head fake to get in the door only makes the book more credible because the White House was cooperative and expected a final product that wasn’t possible. This “head fake” brings me back to the interview. Smerconish did his job and gave viewers an entertaining, thought-provoking segment, which is not always the case when you have two bald white guys in a verbal sparring match. I hope Michael Wolff takes a look at the tape and realizes he could have easily gotten the best of this situation by knowing the track record of his interviewer and appreciating the fact Smerconish was not shilling for the White House. Smerconish was just trying to ask a question that had not been asked. Wolff aside, the fact that a new, challenging question from an interviewer who agrees on many political issues with an interviewee is enough for the interviewee to lose it doesn’t speak well to people’s willingness or ability to disagree. Larry Ceisler is a Pennsylvania-based public affairs executive. If you’d like to reach him, please email smerconishwriters@gmail.com. Who is Lying About "Shithole"?